Educational Qualification: Candidates should have passed Graduation Degree with minimum 60% marks and MBA/PGDBM/PGDM/PGBM/PGDBA/Post-Graduation Degree in Commerce/Science/Economics/Law or CA/ICWA/CS. Application Fee: General/OBC candidates have to pay Rs. 600 and SC/ST candidates have to pay Rs. 100 through online mode using Net-banking/Credit or Debit Card/E-Wallet. Selection Process: Selection of candidates will be made on the basis of Online Examination or Interview. 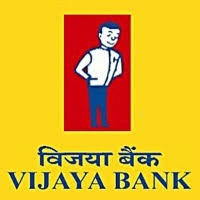 How to Apply: Interested and eligible candidates may apply online through Vijaya Bank website - https://www.vijayabank.com/ - from 12-09-2018 to 27-09-2018.